Frankincense essential oil has several very remarkable and even surprising uses, including its ability to help you naturally deal with stress and anxiety. It can also be used to enhance your immunity, fight off colds and respiratory problems, heal wounds faster, improve digestion and promote sound sleep. It is even useful for oral and skin health. As far back as ancient biblical times, frankincense has been seen as having fantastic health restoration properties. This 5000-year-old natural remedy is mentioned in the Bible itself – where it is considered a remarkably valuable substance on par with gold and silver. Even the ancient Egyptians used frankincense in their culture and their medicine, drawing pictures of its use on their ancient temple walls. Thanks to the research that has been carried out around the world into the use of frankincense oil, it has increased significantly in popularity and use in recent years. Below are 10 proven benefits you get from using frankincense. Your immune system is what provides your body with the ability to ward off dangerous infections and heal any wounds you receive. Frankincense can assist your immune system in this process because it includes boswellic acids. This compound has been demonstrated to modify and assist the human immune system in battling infections. A major study carried out in mice revealed that the use of frankincense could help enhance T-cell interactions. T-cells are the part of your immune system that will respond if a foreign substance invades your body. In this same study, frankincense oil was also shown to significantly enhance immunoglobulin levels which are the antibodies in your bloodstream that fight off viruses and bacteria. Then there is the fact that, frankincense was demonstrated to reduce hypersensitivity, which means your body will be much less likely to overreact – or react undesirably – to a foreign substance that comes into contact with. (1) This is a feature of frankincense that is useful for those who have moderate to severe allergies. Finally, frankincense can help you better absorb the nutrients from your food. Mix a teaspoon of coconut oil, a teaspoon of honey and a single drop of frankincense and swallow it. Or you can place a single drop of frankincense directly under your tongue. Keep in mind though that you should check with a professional before doing this. Ancient peoples believe that that frankincense could be very efficacious when applied to and injuries. And certainly, modern researchers have found that the use of frankincense provides you with certain antimicrobial properties that can help prevent or reduce the severity of infections. (2) This may be the reason why frankincense has long been considered an effective means of speeding up the healing process for minor cuts and injuries. It can help with razor burns too! With wounds, you should gently rub a small amount of lavender oil on the wounded area. Follow this by diluting a few drops of frankincense with an equal amount of coconut oil. Rub this into the area as well. You should use lavender oil as well because it is believed to help in speeding up the healing of wounds and in destroying bacteria. If you’re feeling stressed out at the end of the day, putting just a little frankincense oil in a diffuser and trying to rest and relax a bit can make a huge difference in how you feel. Research has demonstrated that when you inhale frankincense, it can lower your blood pressure and heart rate, which can, in turn, can help relieve anxiety and stress. Studies have also demonstrated that frankincense can reduce depression without resulting in any negative or harmful side effects, such as drowsiness. (3) In addition to this, when you combine frankincense with lavender and bergamot and dilute it with sweet almond oil, it can give you a real boost of energy throughout your whole day. Put several drops of frankincense into your bathtub. Dilute some frankincense into sweet almond oil and run this on to your feet. Frankincense can also offer you relief from a stuffed up nose. Researchers have revealed that frankincense processes clear anti-inflammatory abilities that can rapidly reduce nasal congestion and phlegm building up in your lungs. For anyone who has bronchitis, asthma or allergies, frankincense can be a real boon. (4) Moreover, it is a much more natural approach to dealing with these problems than the antihistamines and steroids you might get from a pharmacist or a doctor. Mix frankincense into a diffuser and place it inside your bedroom. For faster, immediate relief, but a few drops of frankincense in a cloth and inhale through it when needed. Most people fail to realize just how important their oral health is. It’s not just a matter of maintaining your teeth so that you can have a nice smile. Losing your teeth or otherwise having bad oral health can affect your body overall. They can even increase the chance of heart disease. If you would like to find an entirely natural way to maintain your oral health, frankincense might be exactly what you have been looking for. 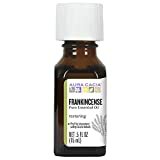 Frankincense has antiseptic properties that can prevent many common oral problems, such as bad breath, and gingivitis, canker sores, and cavities. (5) This is the principal reason why so many early civilizations chewed frankincense resin, since they knew that it would strengthen their gums and teeth. Mix a single drop of frankincense, two drops of peppermint oil, a dash of salt and enough water to give it the consistency of mouthwash. Rinse your mouth with this once a week. Simply mix a few drops of frankincense into 1 mL of primrose oil, massaging this mixture onto your abdomen. Apply two drops of sandalwood oil and two drops of frankincense to your abdomen, gently massaging it in pain and cramp relief. Sandalwood oil is well known for its ability to reduce the pain resulting from endometriosis as well. This is a condition in which tissue from your uterus grows outside of the uterus. Mix two drops of frankincense into your current moisturizer. Mix frankincense with lavender oil and apply this mixture to any scar tissue after you take a shower and before going to sleep. As mentioned above, frankincense is known to have certain anti-inflammatory abilities. This means it has the potential ability to reduce the production of information related to a range of diseases, including inflammatory bowel disease, hepatitis, Crohn’s disease and asthma. (8) In addition to this, the boswellic acid the frankincense contains a mental breakdown of your cartilage. Cartilage deterioration is very common for those who have rheumatoid arthritis, which is why the relief from arthritic discomfort provided by frankincense is so valuable. Mix equal amounts of almond oil and frankincense and apply this to your aching joints – almond oil has also proven to have anti-inflammatory qualities. Simply apply a few drops of frankincense to your joints and rub it in. It has been proven that the use of frankincense can significantly improve your body’s digestive functions. (9) It appears to increase the production of gastric juices, which in turn could aid in better digestion in your stomach and intestines. In addition to this, the boswellic acid frankincense contains also appears to reduce symptoms of chronic colitis, ulcerative colitis, and other serious intestinal disorders. Minimizing the symptoms of these chronic disorders can significantly improve your overall health. Mix 1 mL of sesame oil with a single drop of frankincense, massaging the resulting mixture onto your stomach and abdomen to reduce feelings of conservation and flatulence. Sesame oil is valuable for this purpose since it has been shown to improve circulation thanks to its high levels of zinc. One of the easiest ways to use this oil to improve your memory is to add three to four drops into your diffuser and let it run 30 minutes before you go to bed. You’ll be able to inhale the scent while you rest, and it’ll go to work throughout your body. Frankincense oil intrigued me from the start. How could you not be curious about something used for thousands of years with even a biblical history? After all, there had to be some reasons why people considered it so valuable back then and now. I began my journey into its past with some background to put it in perspective. Boswellia trees are the source of the resins used to make the oil. (11) You won’t find them growing in the United States but rather the Middle East, Africa, and India. Early Greeks and Romans such as Herodotus and Pliny the Elder wrote about it. When you first smell frankincense oil, you’re transported to an exotic place with its heady aroma. People have used it as you’d expect as incense and a perfume because of it. But new scientific research has found that it has antimicrobial activity. (12) It confirmed the benefits that even the ancient Egyptians used it for, namely, treating wounds and sores. For me, it was all about the scent. It’s so relaxing to use it in a scent diffuser for some welcome stress relief and to help me sleep at night. It makes an excellent air freshener. A few drops in your bath water is a great way to unwind. The last thing I wanted to do was to verify that it was safe. As it turns out, there isn’t anything pointing to it being harmful or causing side effects. (13) It’s always a smart idea to test it on an inconspicuous area of your skin first, just in case. Frankincense oil provides a great way to use it in a diffuser to fill a room with its pleasant lemony, pine-like scent. You can also add a few drops to a carrier oil to massage it into your skin. The aroma combined with the soothing oil will soften your skin and leave it smelling wonderful. You can use it on its own or combine it with other essential oils like myrrh or lavender to create your signature blend. A little goes a long way. Experiment with different combinations to find the one you like best. 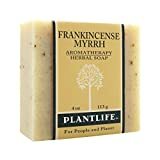 Frankincense oil in soap brings the freshness to your personal care. Look for one that safe to use on all skin types. It’s an excellent way to take advantage of its antimicrobial properties to keep your skin clear with no blemishes. A product with glycerin which will moisturize your face and won’t leave it feeling dry. The scent is incredible and offers an excellent way to start your day. You should use it with a draining soap dish to get the longest use out of it and prevent it from washing down the drain—literally! You can find frankincense oil in its natural form as hardened resin. It opens up a whole new world of possibilities for upgrading your skincare routine. You can crush up the chunks and add it to your toothpaste or mouthwash to kill harmful bacteria. They are edible so that you can eat them too. That was, after all, another of its folklore uses. But, wait, there’s more. You can also place the tears in a burner to use it the traditional way as an incense. Because they’re small, you have more control over how long it’ll burn. And the great thing about them is that they don’t expire. As with any other essential oil applied to your body, you will want to carry out a spot test to check for any sensitivity or allergic reaction. There has been considerable discussion about whether pregnant women can safely use frankincense. Since frankincense is known to stimulate blood flow to the uterus and the pelvis, it would be best for pregnant women not to use frankincense – at least until further research can demonstrate that it is safe for them. When you are purchasing frankincense, ensure that it is entirely pure and organic. If you want to be absolutely certain about the product you’re buying, it might be best to make your purchase from a reputable aromatherapist. Always keep in mind that it is best a so-called “carrier oil” whenever you are taking frankincense orally or applying it directly to your skin. This is because frankincense can be rather harsh otherwise. Some of the carrier oils that can be used effectively with frankincense include almond oil, lavender oil, coconut oil and jojoba oil. Last of all, when you’re using frankincense – either by applying it skin or taking it internally you should always consult with a qualified aromatherapist as to the correct dosage and usage instructions. So it is reasonably clear that there are many proven benefits to using frankincense. These benefits can include pain reduction, boosted energy levels, mood enhancement, improved digestion and better oral health – to name a few. Choosing to use frankincense only makes sense, given that – in addition to the wisdom handed down to us from ancient times – modern research is helping to confirm its effectiveness for a number of ailments. But, make sure that you consult with an experienced aromatherapist and your physician first.